On Oct. 25, 2018, division head of Career and Technical Education Jeff Bott was recognized for a “Those Who Excel” award. Put forward in a nomination by principal Jeff Wardle, the award highlights the best teachers and community partners in the state of Illinois. Out of seven categories of awards ranging from administrators, teachers and news and media, Bott has been selected as one of the 22 administrators for the administrator award. In addition to the latest recognition of the CTE department, Wardle has hired three additional full-time teachers in the last five years because of the growth of pathways in CTE based upon student interest. The classes in the CTE department provide students with an opportunity to pursue an area of passion and expertise and have instructors that are kid-focused, providing the most important lessons for their students. 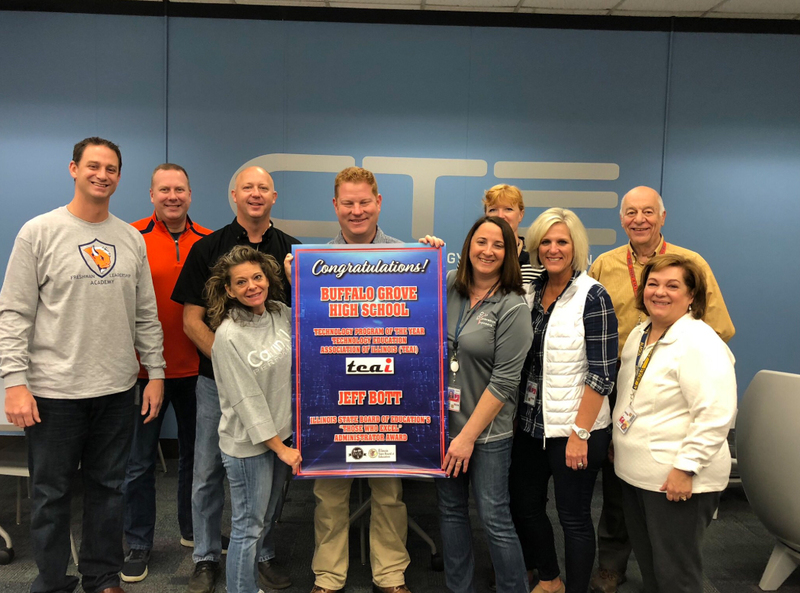 BG was also recently named as the Technology Education High School Program of the Year through the Technology Education Association of Illinois (TEAI). The High School Program of the Year award acknowledges BG’s technology education program, serving well over 450 students in several career pathways, including manufacturing, engineering, graphic arts, media broadcasting, automotive technology and informational technology. The award was presented at the Illinois Technology Education Conference on Nov. 2 in Bloomington, IL. According to Bott, technology teachers such as Murrin, Sara Farrell, Philip Tschammer and Kyle Pichik do incredible work and spend an incredible amount of extra time engaging with feeder schools through BG’s Next Generation of Engineers program. This program is a middle school outreach program for STEM and computer science. Once a week, BG hosts 6th-8th graders to take classes here. From schedules to different grants to exploring new spaces and manufacturing labs, the CTE department dedicates their time and effort establishing an ideal and welcoming space for all students and staff members. Most CTE classes are aligned with both Dual-Credit and certificate offerings for students, ranging from college vocational auto to college accounting. Students earn the opportunity to prepare for college or to go straight to the workforce, making a “living” wage directly out of highschool. According to Murrin, typically the CTE department has not seen too many awards over the years and by winning the TEAI award and Bott’s award, it has meant a lot to them.